Kitten sale scams - avoid them! Unfortunately there will always be people out there looking to make a quick buck at the expense of someone else, and the pedigree cat and kitten market is no different. When you are looking to buy a British Shorthair kitten, or any other pedigree kitten: keep your wits about you, ask lots of questions, and be aware of some scamming tactics that are commonly used. There are several prominent kitten sale scams out there. This is the most common scam around at the moment, and it is done to different degrees. Another is someone who has 2 cats that are genuinely pedigree cats..BUT they are close relatives, like brother and sister. No cat registry would allow such a close mating, because that level of inbreeding causes serious health issues. Therefore, the kittens can only be sold as 'unregistered'. Unless your kitten is registered you have no way of knowing if they are inbred, or if they are health tested for genetic conditions. Another scam is selling ‘pedigree kittens’ that are unregistered and not even from parents of the breed in question. Often kittens with only one British Shorthair parent and one moggie parent are sold as ‘unregistered pedigree British Shorthairs’. Sometimes it goes even further - there was a well reported news story recently where a family bought a Sphynx kitten. They were told it was a pedigree kitten, but wasn’t registered because it made no difference if it was registered or not. It soon became apparent that the kitten was not in fact a Sphynx at all, but a moggie cat, when its fur started to grow back after having been shaved off! Read the article here. 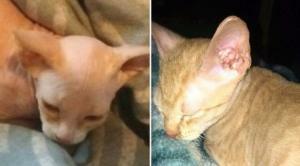 The photo below shows the 'Sphynx' that turned out to be a shaved moggie cat! Poor cat! Remember, if a kitten is not registered, then its pedigree, lineage and breed are not in any way certified or guaranteed, and the kitten could be anything! Kitten sale scams: 2 long distance robbery! In this scam, the scammers steal photographs of genuine, registered, pedigree kittens from reputable breeders. I know several breeders who have had their photos stolen and now do not email photos to anyone as a result. The scammer then creates an advert with the genuine photos, and when they receive interest in the kitten they ask for a deposit to be sent online, or for a delivery fee to be sent to them. Once they have the money you never hear from them again. Be very wary when sending money to someone you have not met, especially if they only have an online ad and no website or real presence of their own. Here, as above, scammers steal photos of beautiful, healthy looking kittens and use those images on their adverts. Their kittens, however, are not so beautiful or so healthy...but the unsuspecting buyer won’t know this until they turn up. The scammers work on the basis that, by the time you have paid a deposit for a kitten and come to pick it up, some time will have passed and you won’t realise the difference in quality between the photos you saw and the kitten you now see, particularly when they tell you that kittens change as they grow! Please keep your wits about you and be wary - every time a scammer is successful it encourages them to continue, meaning more and more people fall foul of the scammers. On top of that, it perpetuates the cycle of unwell, badly cared for kittens and puppies in the world. Take your time when you choose a new kitten or puppy - do not rush into it. Choose a reputable, ethical breeder who does not cut corners to penny pinch at your expense. If you enjoyed this article, read on to discover more about the beautiful British Shorthair breed and what goes into a Bombadillo kitten! - Considering a Persian or Exotic kitten? Read this first.